restylingmag.com May 2015 | Restyling & tRuck AccessoRies 11 of big box retailers driving awareness of product segments. "Awareness of what our industry has to offer is probably the largest issue we face," he says. "As we've diversified over the years, the sheer number of different services we offer makes it a bit more dif- ficult to advertise them and truly get the word out. People often come in and seem shocked as to how nice our facility is and the variety of services we offer that they didn't know existed. "One of the disadvantages of the decline of the big box stores is that they aren't pushing the products we sell on TV or in newspapers anymore. Shouldering the advertising budget to get that out to the masses is difficult for a smaller shop to do." Even with such challenges, Bartells feels blessed to be working in an industry and building a company that he's passionate about and is proud of. The best part of his job? "Not hating to get out of bed everyday and go to work," he says, noting that the shop has plans to open a second location across town this summer. 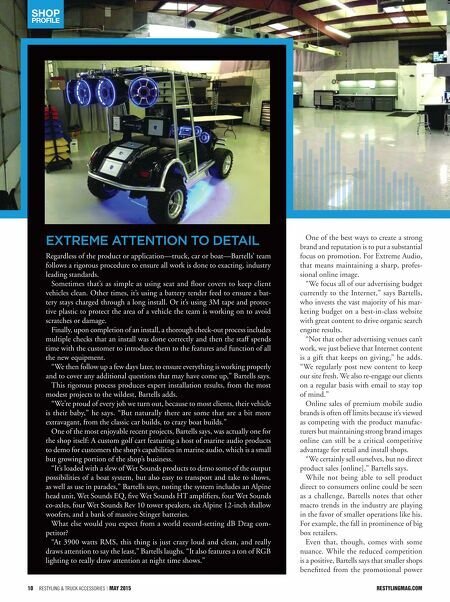 The new loca- tion will feature great visibility and prox- imity to a Harley Davidson dealer, which he believes will help drive Extreme Audio's truck accessory business forward. "I was lucky enough 24 years ago to start a job doing something I loved as a hobby," Bartells says. "I've certainly shifted into being more of a business owner these days, but having that drive to be the best keeps me going. "Making that transition from competitor and enthusiast to being a business owner isn't always easy," he concludes. "But for me it's been a lot of fun." As an industry leading shop with a growing national reputation for excellence in all facets of the business, it's pretty clear to see why there's so much fun to be had at Extreme Audio. "Most veterans in the industry like the way we do things and seek us out when openings arise. This has led to the best crew we've ever had, with a diverse range of experience cover- ing all the bases," Bartells says.